I've got something new to share with you today...a bit of a New Year's gift to you, so to speak, so I hope that you like them. I started playing with the creation of some word art recently. I started it for use on my own layouts, but then thought, "Why not share?" I'd love to hear what you think of them and would love to see any creations that you might use them on. 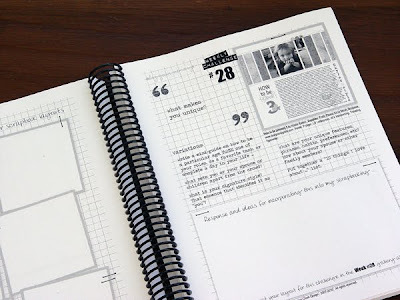 I can honestly say that I have never had the opportunity to review a book quite like the Scapbooker's All-in-One Memory Log Book 2010 designed by Kristin Rutten from Log Your Memory. While there a few layout samples included in the book, the focus is clearly on the STORIES hidden within your daily life. This book gives you a very effective tool to help you record those stories so that they end up in your scrapbooks and not lost somewhere in your mind or random scrap of paper. Rather than an idea book full of eye candy that you'll flip through in an evening or two (not that these idea books don't have their place on our inspiratinal bookshelf as well ;) ), the Scrapbooker's All-in-One Memory Log Book 2010 is really more of a workbook that will take you through the entire year. If you recognize yourself in one or more of these, this book is for YOU! *Monthly calendars for at-a-glance planning and recording. *Daily calendars where you can jot down your schedule and extra space to make notes about things that happened that day. *Your own personal "Story List" - a page where you can list the page ideas you have before you forget them! *A weekly sketch page where you can map out your designs. *Weekly challenge questions to get your creative juices flowing and tell the "real" story of your life. There is a main question, but also always several variations so that you can use whichever prompt speaks to you at the time. *A monthly questionnaire to help you track how life changes over the course of the year. *An annual questionnaire and price sheet to help set the stage for where you are in your life right now and the workd you live in. *Monthly worksheets for documenting family holidays, plus extra pages at the back of the book for birthdays and other celebrations. *A handy list of 2011 holidays. "Think of this book as a framework...If a question doesn't speak to you, don't answer it. If you get an idea but it's not exactly what was suggested, run with it. This book is for you and it's up to you to make it your own." Personally, I am quite excited about the year ahead and the place this book will take in my creative process!! 1. 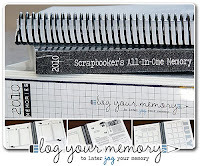 One free copy of the Scrapbooker's All-in-One Memory Log Book 2010 in your choice of perfect or spiral bound. 2. 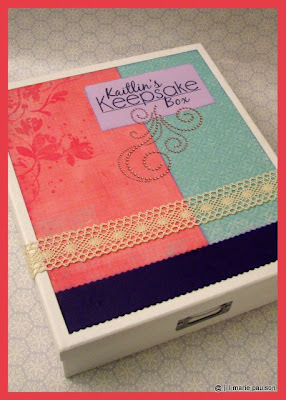 One free download of the Scrapbooker's All-in-One Memory Log Book 2010. 3. One free copy of List Your Life in the winner's choice of format (download, print, or writeable eBook). How about starting out the New Year right with not one, but THREE chances to win!?! To enter, leave a comment on this post telling me if you have any New Year's resolution(s) - especially those related to crafting - by Thursday, December 31st, 2009, 11:59 PM CST! I will announce the winners on New Year's Day!! Here's a few items that I made for Kaitlin for Christmas. She opened them on Christmas Eve...one of the few we still let her open since we were stuck in at home. She picked well because she got a 3-for-1 on this one as they were all wrapped together! Up until now, Kaitlin's been using a standard photo box for her 'keepsakes' (letters, cards, pictures, etc), but not being very big, she often had to fold things to get them in there which wasn't ideal. I found this large box at Wal-Mart (its about 13x16) and decided to decorate it a bit to ake it extra special. I've actually had these letters for quite awhile now. I meant to give them to her LAST year, but just didn't get them decorated in time. I've also had the supplies for this mobile for awhile also...better late than never, I guess. 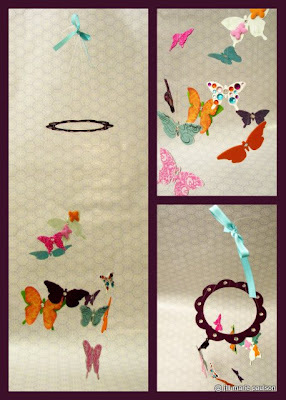 Each butterfly is decorated differently. 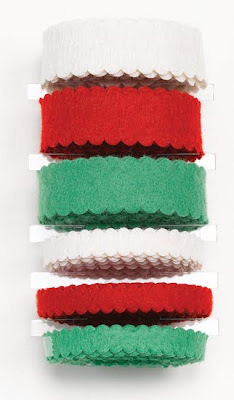 Jewels, glitter, felt, ribbon, buttons, rubons, crackle paint...you name it, it's on there. You can click on each of the pictures to see larger versions. I hope everyone is having a safe and warm Christmas! We're seeing quite a bit of white and wind here in South Dakota at the moment, so it's delayed some of our usual Christmas plans. However, I don't what to let that delay the announcement of not one, but two lucky winners!! Watch you inbox for further details on how to claim your prize! MERRY CHRISTMAS TO ALL! Stayed tuned to the AMOM blog for more great giveaways coming soon! Check back later today for the announcement of the Super Fast Pages w/ 4x6 Photos Vol. 2 winners! So, is anyone else going to be snowed in for Christmas? It looks like we will be and our traditional holiday get togethers may be delayed a few days this year. We are smack dab in the middle of a huge winter show storm system here in South Dakota. I heard on the news they expect it to be the 'worst' since 1968. Anyway, we're hunkering down and trying to enjoy some quite time at home. Kaitlin and I just finished watching The Sound of Music a bit ago. I LOVE that movie (just makes me want to sing), but it was Kaitlin's first time watching the whole thing. We might have just started a new holiday tradition! :-) I know it's not a tradition holiday movie, but with wonderful music and a strong theme of love and family, how can you go wrong? On another - and more crafty - note, yesterday was Kaitlin's last day of school for the year and we were sure to get a few little gifts delivered when I picked her up. #1 - This one was for her teacher. 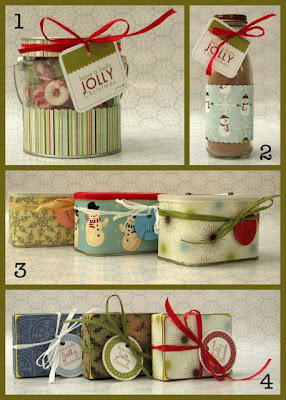 I refurbished a My Mind's Eye chipboard canister and filled it with holiday life savers. The back of the tag says, "A great teacher is a lifesaver. Merry Christmas!" #2 - This one was for her principal. It was a Starbucks Frappuccino bottle, but is now filled with hot chocolate mix. Mmmm...good thing we have some here at home also. I think we'll be enjoying some of that ourselves in the next day or two! #3 - These three were for the gals at JFK (her after school program). They were General Foods International containers and are now filled with holiday M-&-M's. #4 - These boxes were for a few of her other teachers like PE, art, etc. They were Whitman's cholcolate samplers. That candy was long gone (since last Christmas :-) ), but they held a handful of holiday Hershey's kisses nicely. I tend to 'collect' containers of many kinds throughout the year just for occasions like this. They are fun to redecorate rather than just throw in the trash and more economical than going out and buying new containers of some sort. I used all scraps to decorate them, so you'll see a little My Mind's Eye, Basic Grey, Pink Paislee and even a little Chatterbox in there (I had to dig pretty deep in my scrap backet for that one!). If you like the tags I used on most of them, you can find them here. I think I'm going to be printing out some extras of those puppies!! LOVE them...thanks, Rebecca. I usually don't make any handmade cards (I've only done it a handful of times before). For some reason, I was in the mood to do a few Christmas ones this year. What's funny is that I already had my cards (store-bought) ready to go for this holiday. Perhaps I save them and use them as a start for my first-ever handmade only Christmas card mailing NEXT year! With so much focus on quick and easy scrapbooking, being able to use standard 4x6 prints in unique ways is a key componant of any fast scrappers arsenal of techniques. 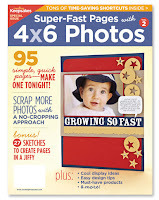 Super-Fast Pages with 4x6 Photos 2 from Creating Keepsakes helps wanna-be fast scrappers achieve this technique. There are 34 layouts included in this chapter with a nice mix of 12 x 12, 8 1/2 x 11 (vertical and horizontal), and even a double-page spread or two! In this chapter, there are 27 layouts - again with a good mix of layout sizes. Naturally, there are more double page spreads included in this chapter. 20 layouts make up this chapter. Not surprisingly, this section is comprised entirely of double-page spreads - even one with TEN standard 4x6 prints!! Finish it Faster: These tips are included with EVERY layout. It either points out a product in the layout that helped the artist finish in a flash OR makes a suggestion for how an element or technique could be achieved in a faster and/or easier way. Bright Idea: Nearly every layout is graced with one of these great ideas. 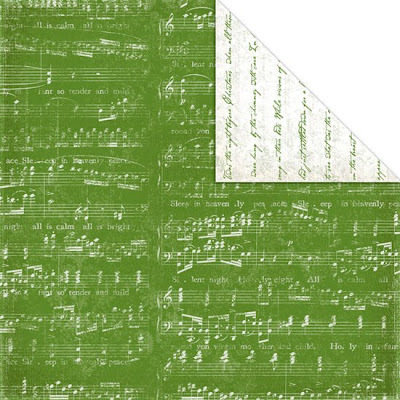 You could look at them as mini-challenges to use on your next layout such as typing your journaling on an antique typewriter for a faded, distressed look. Maximinze Your 4x6 Photos: Ideas to help your photos shine. Perfect Products: Manufacturers that keep 4x6 scrappers in mind make our lives much easier. This section lists a few to top your shopping list. Sketches for Your 4x6 Photos: Includes 27 sketches to help you scrap your 4x6 photos faster. Photo Corner Finesse: This section helps you add personality to your photos with several cute and quick options. Design Tips: Tips from the 2009 CK Dream Team members themselves! Fast Albums with 4x6 Photos: 2 unique ideas wondrous mini-albums - no photo trimming required. Display Ideas: 4 ideas on how to display your photos outside your albums. Side note...if you get your hands on this issue, you might recognize the scrapper featured on pages 108-109 and 126-127. :D I was very honored to have two of my 4x6 only spreads chosen for publication in this special issue! 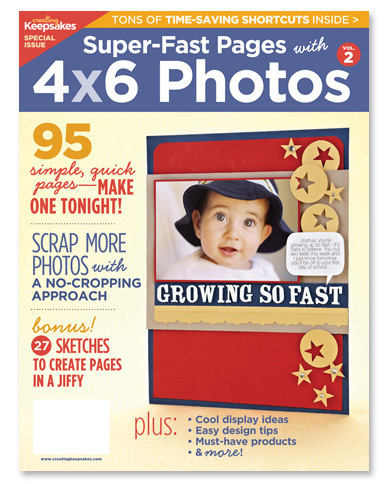 Would you like a copy of Super Fast Pages with 4x6 Photos Vol. 2 ? Well, I've got not one, but TWO copies to send on out to TWO lucky winners thanks to the generous ladies over at CK! Leave you're comment by Thursday, December 24th, 2009, 11:59 p.m. to be eligible. I imagine you'll be a little busy on the 24th, so don't delay - do it now! I will determine and announce the random number winner on Christmas Day! 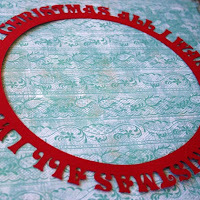 **These Holiday Quotes from Creating Keepsakes are sweet! 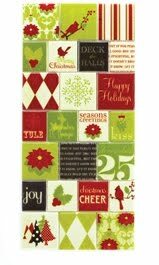 Some are the perfect size for holiday cards, but they could also be used on layouts and other holiday crafts. 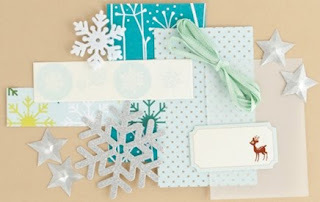 **Check out the Scrapbook & Cards Today blog for a free download of some super cute tags to adorn all your holiday packages! They come in two color variations so your certain to have some to match your wrapping paper (if you're the 'matchy' type). **I have to share this link with you because I found it simply inspired. Elizabeth Dillow from Write.Click.Scrapbook. has reminded me what the spirit of this season is all about! 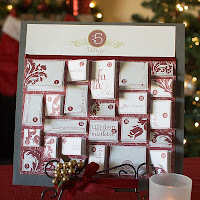 **I know that I already made my Advent Calendar, but this one has me wanting to create another one...maybe next year! I love the idea of the little openings that fold out. I think I would do this the 'traditional' way by creating mini-cards to attach to the background. Perhaps in each card could be a holiday-related activity to complete for the day. 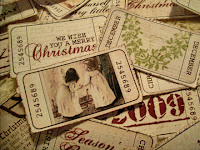 **These wonderfully vintage Christmas tickets from The 80's Me blog could used for an endless number of crafting projects!! Have you found any especially delightful downloads or inspiring stories in the spirit of the seasonon the web lately? If so, please share! This is one of my favorite Christmas layouts I've ever done which might seem strange since it doesn't include any people. However, it does include things that remind me of the season and the traditions that we enjoy during this time of year. That, in turn, makes me think of fond family memories. The glittered paper adds a sense of elegance to this page about my favorite holiday and the signs of the season around our home. The three tags labeling the photos create a visual triangle that leads the eye around the page. :GIVEAWAY WINNER: Who's getting a little something from The Scrappy Shack? And it's time to announce the winner of some free custom die cuts from The Scrappy Shack! Congratulations, Michelle E!! Watch your inbox for further details on how to claim your prize. :FIVE FAVES: Do you feel a little winter chill? Considering we haven't had a daytime high temperature above freezing since December 2, I certainly am!! If the chilly temps put you in the mood to scrap some cool layouts, here's a few great products to get you started. 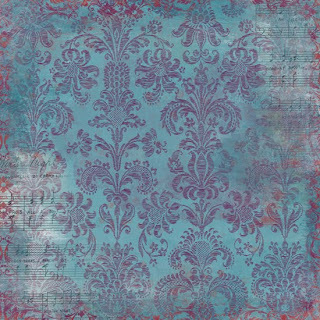 I love the distressed brocade in blue...the hint of vintage music peaking through is a wonderfully surprising touch. 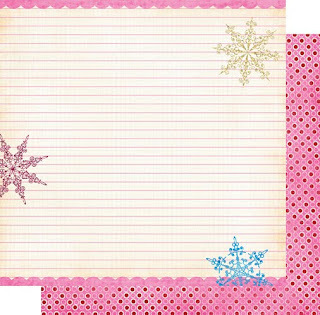 Wintry swirls and snowflakes in white are the perfect touch for your frosty creations. One thing I often love about Fancy Pant's collections is their unique tweak of seasonal color combinations. I also always love papers that give me lines to design by and to journal on. I couldn't write in a straight line without 'em if my life depended on it! How 'bout you? I love the idea of these Vintage Findings kits from MM. Often I love a certain embellishment, yet I know I'll never use an entire package of them. These kits solve that problem by only including one or a few of each kind of embellishment - all perfectly coordinated for you creating pleasure. 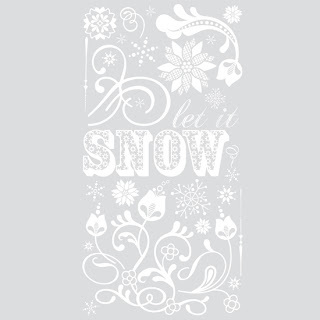 I'll admit...I've never used an iron on transfer on a layout, but I just love this two-toned pattern which seems to perfectly embody the idea of blowing wind and snow. 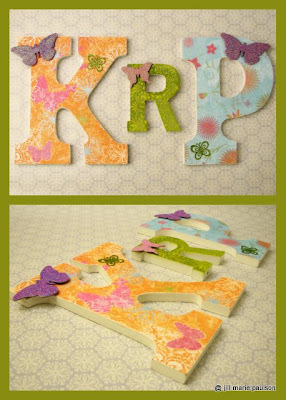 Have you used iron on transfers on your layouts before? How do you like them?? 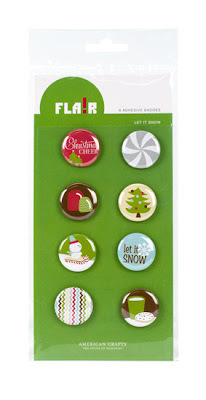 For more great winter-themed products, see the :WINTER PICKS: box in the sidebar. What cool new winter picks do you have on your wish list (or, if you're lucky, already in your stash or in your scrapbooks)? Leave a link! "Never are voices so beautiful as on a winter's evening, when dusk almost hides the body, and they seem to issue from nothingness with a note of intimacy seldom heard by day." At work, I am the advisor for about 35 student workers as part of my position in admissions. We have a group called ADMIT that helps us with events, giving tours to prospective students and more as well as student callers and workstudy students. One minor part of this duty is planning a Christmas and end-of-year event. It's always such a busy time of year for us in Admissions and for the students as well with finals, so we decided to do an all-afternoon open house last week with goodies, hot apple cider, and Christmas music so they could stop in whenever they had time for a little study break and some socialization. To give this plain brown little bag something 'extra', I used the scalloped blade on my trimmer to put a nice decorative edge on the top of the bag. I used some inexpensive raffia to attach the tag and seal the bag. *A TOOTSIE ROLL to remind you not to bite off more than you can chew. *SMARTIES to remind you that you're no dummy. *A STARBURST to give you a burst of energy. *A LIFESAVER in case you feel like you're drowning in information. *A STICK OF GUM to encourage you to stick with it and don't give up. *A MINT to tell you that you're worth a fortune to the Admissions Office the whole year through. *A HUG to remind you that we're here for you, too. And when finals are through, you can let out a big YOOHOO! There is one of each of the bolded items inside the bag. The AMOM blog has a new sponsor and I couldn't be happier to share her products with you! 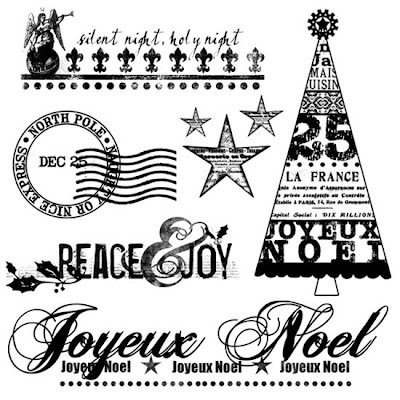 Lori - from The Scrappy Shack - specializes in die cuts, lace papers and more which are perfect for crafting. Her designs are quite unique and come in a variety of colors and patterns. I picked a couple of my favorites to share with you on the left. This I See the Moon Die Cut Lace Paper is just darling and the All I Want for Christmas Circle is just in time for the holidays! She has also been gracious enough to offer a giveaway as part of her new sponsorship! To enter, simply comment to this post with the link to your favorite single die cut in The Scrappy Shack shop by Thursday, December 17th, 2009, 11:59 p.m. I will let Random.org choose the winner on Friday, the 18th, and that winner will receive not only their favorite, but also three more single die cuts of their choice! The December 2009 edition of the :Be Inspired: Creativity Prompts is now ready for free download! Please let me know how it works for you and if you like it better than being redirected to the download through 4shared. You can also now just click the Twitter or Facebook buttons on the above preview to share with your crafty friends! Download the FREE December 2009 :Be Inspired: Creativity Prompts now and start scrapping!! I think this is working okay for most of you, but based on a few comments I've been receiving, I did want to give you a few more details on the download/printing process through Scribed. TO DOWNLOAD: To save a copy to your computer for later viewing or printing, you will need to register with Scribd. It is a one-time registration and I do believe Scribd to be a safe site, so don't hesitate to do so if you wish to download. TO PRINT: If you wish to print right away and don't need to save the document to your computer, you can do this WITHOUT registering with Scribd. Simply hit 'Print' on the top bar of the preview box and, assuming you computer is hooked up to a printer, a print box should pop right up. Please continue to let me know how the download/print process is going for you - good or bad - so that I can make an educated decision whether or not to stick with Scribd. It does have some really neat features, but if the cons outweigh the pros for you, I can certainly go back to the old way and/or explore other options. The Federal Trade Commission approved new rules for blogging endorsements in 2009 which has prompted the creation of this disclosure for the A Matter of Memories blog. Personally, I think that you, my readers, are all generally smart enough to realize that I might like to earn a little money off my blog to help support my blog. What a novel concept, right? A Matter of Memories is a personal blog following my scrapbooking and photography pursuits (and a little of everyday life mixed in). All posts are written by me and feature my personal experiences and opinions. I am currently an affiliate with several companies related to the topics of my blog. I also accept forms of paid advertising and sponsorship. I must note that I choose my affiliate relationships carefully. I have been and am a customer with each and every company for which I am an affiliate. 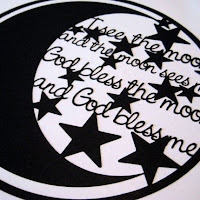 I feel that I can honestly recommend companies such as Amazon.com, Two Peas in a Bucket, Scrapbook.com, Joann.com, etc. to others through my own experiences of service and product quality. Therefore, the content of the AMOM blog will sometimes include affiliate links. I take a similar stance when accepting paid advertising and sponsorships for the AMOM blog. I will not feature advertising or a sponsorship if I do not believe that they offer a quality product and/or service that matches the topics of the blog. I have refused a request for advertising or sponsorship in instances when I did not feel that these qualities were met in the past and will continue to do so in the future. One of the major features of my blog is reviews related to my blog topics. I have never been paid to write a review, nor would I agree to such an arrangement. Publishers will sometimes send me a free review product, but I often purchase the products personally as well if I feel it will be of use to me and of interest to my readers. I have also received review products in the past that I chose not to review as I felt they did not fit the topics of my blog or interests of my readers in an effort to keep the A Matter of Memories blog a specific and viable resource. Giveaways are also a great feature of the AMOM blog. Giveaway products are always a donation from the publisher or manufacturer. I abide by word of mouth marketing standards. Regardless of income received or how I obtained product for review and/or giveaway, I always give my honest opinion, findings, beliefs or experiences on those products. The views and opinion expressed on this blog are purely my own. Any income that I do receive through my blog is generally used for the benefit of the blog in the way of postage (mailing giveaway prizes to recipients) and making product purchases relevant to the topics of my blog (more books and products to review). I would also like to disclose the following existing relationship. 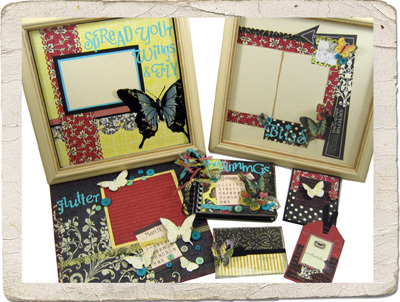 I happen to be a consultant with a direct-sales scrapbooking company called MemoryWorks and will from time to time feature their products in my blog posts such as the MemoryWorks Express Kit (their monthly kit program). This disclosure policy was established and posted on December 12, 2009, but applies to all past and future posts to the A Matter of Memories blog.